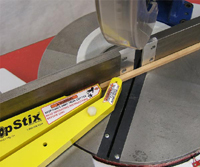 Incorporated into the ChopStix design is the holding arm that requires the placement of the operators hand, safely distance from the path of the blade or cutter during the machining operation. 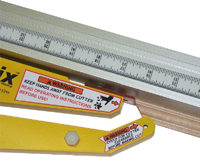 Constructed of plastic components, should the contact extension or holding arm make accidental contact with a blade or cutter, no tooling damage will occur. 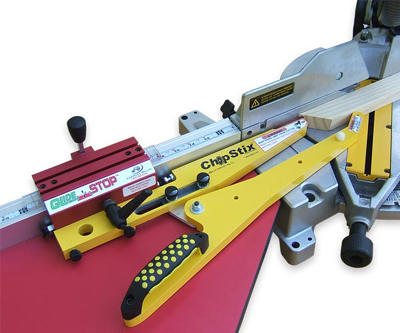 By extending the contact surface of the stop, the stop can now provide precision measurements not possible before by safely reaching beyond the stop systems own guide fence. 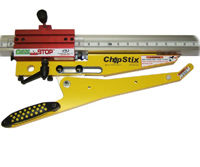 Designed as an accessory, the ChopStix can be added to existing GlideStop Systems. The design also allows for either permanent or temporary mounting. 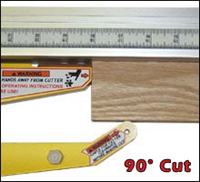 The ChopStix can make 90° or 45° degree cuts thanks to the doubled sided Lexan plate and adjustable handle positions. The holding arm adjusts back and forth for a better holding position on the piece to be machined. 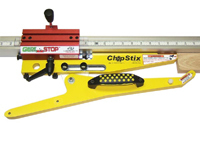 The ChopStix extends the reach of the GlideStop by 10". 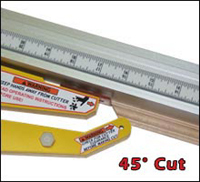 Our design allows you to safely cut short parts without placing your hands near the cutting path of the blade. 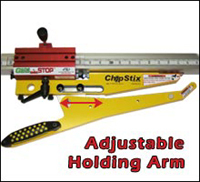 The ChopStix is a removable accessory for the GlideStop that can be quickly attached when the operator is required to cut short parts. In 2005 alone, the U.S. 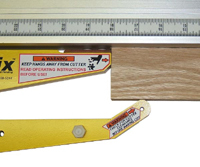 Product Safety Commission reported 29,779 miter saw injuries requiring a trip to the hospital emergency room. This product is designed to keep hands away from the cutting path.